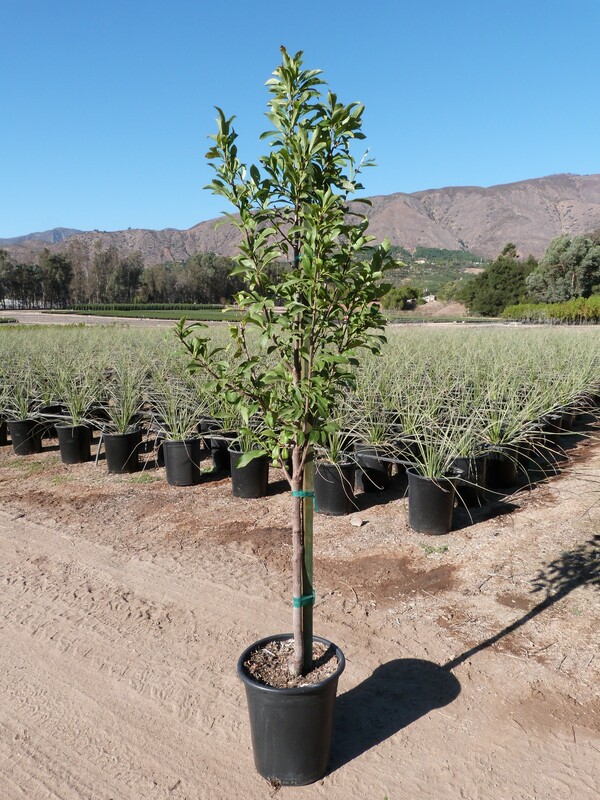 Plum trees are not only wonderful blooming additions to the drought tolerant landscape, but they are also one of the easiest of the fruit trees to grow. In very early spring, plum trees produce bright white flowers, some with a very strong fragrance. They are one of the earliest fruit trees to bloom, with some varieties even blooming during late-winter in warmer climates. Most plum trees will benefit from another plum tree growing nearby for cross-pollination and best fruit set; while some are very good self-pollinators. ‘Satsuma’ grows large, dark-red, very sweet plums excellent for both eating fresh or canning. Japanese plum tree ‘Beauty’ is a self-pollinator and grows to just 15-feet tall and 12-feet wide, making it a great choice for smaller landscapes. An abundance of white flowers in late winter and bright red fruit make it a stand out. ‘Santa Rosa’ is a self-pollinating plum tree that produces medium-sized, sweet fruit great for eating fresh, cooking or canning. ‘Santa Rosa’ grows 15-20 feet tall and about 12-feet wide. ‘Green Gage’ plum trees are among the most unique, featuring small green fruit that blend in with the foliage. However, they are some of the sweetest and juiciest you’ll taste. Though plums are easy to grow, look out for issues such as silver leaf disease, bacterial canker, Japanese beetles, and aphids. Many of our plum tree varieties also come in semi-dwarf sizes for smaller landscapes or large containers. Easy to grow plum trees are a great way to add beauty, fragrance and delicious fruit in smaller urban landscapes.